Class CH (Reception class) had their Friday presentation assembly today. They confidently showed a range of work (based on their topic about 'Ourselves') to their parents and the rest of the school. There was measuring work (numeracy), smoothies (DT), lots of art work, ICT pictures, writing about Elmer and some independant drawing. A brilliant way to end a busy half term. A huge happy crowd of parents and children gathered around the front playground shelter in lovely sunshine. Thank you in you made or bought any of the cakes. Please come along to the Friends cake stall on the front playground - after school today. Class NS/JB looked at a painting by Claude Monet called the Japanese Bridge, which was painted in 1899. We tried to do our own version of the Japanese Bridge using oil pastels, charcoal and chalk. We used different shades of colours to get a good effect. Small horizontal and vertical lines looked good as well as small smudged areas. Some people used the side of the pastels for the water. Mrs Bell looked at our hands and said they looked liked artist hands! They look super because they are all different and we put a lot of effort into the pictures. Class DB have continued their Monet work with some water lily studies. Click on image to see full size or download from front page of our school website. If you are looking for activities for your children or family to do during the October Half Term, locally and at a reasonable cost, please consider the selection below and contact activity providers as directed to book on. Monday 25th and Tuesday 26th October. For complete beginners or more experienced. All equipment and bait provided. Fully qualified and experienced instructors.9.30am-12.00noon and 12.30-3.00pm. £7.00 per session or £14.00 for all day. Transport can be provided. Booking required. Ring 07917071285 or contact your child’s school for booking. For budding Bear Grills! Wednesday 27th and Thursday 28th October. 10am-3pm. £20 for 1ts child, £17.50 for siblings. Booking required. 01394 444652. Wednesday 27th October. 10.00am-12 noon. £5.00. Contact 01394 382836 to book. No experience required. Saturday 23rd October. £4.00 per child. Booking required 01394 444720. Part of the Woodwose Festival. For more information go to http://www.woodwose.org/. Also Archery, Dunwich ForestFor all Robin Hood wannabes out there! Saturday 30th October. £1.00 for 6 arrows. Monday, Wednesday and Friday mornings. Range of fun activities. For more details call: 01728 652110. The annual inter school football tournament took place last Friday afternoon at Stradbroke High School. There were 15 teams (including 2 from SRH Framlingham) split into 3 groups. Our B Team (mainly year 5 boys) did very wll to come 3rd in their group only losing one match. Our A team won their group with 2 wins and 2 draws to progress to the semi finals. Our boys put in their best performance of the day to beat SRH Debenham by 2 goals to nil. In the final they played Laxfield. Despite constant atacks SRH could not score. Our goalie did not having anything to do but the game (which had to be shorten due to the tournament over running) finished goal less. There was no extra time or penalties so we shared the trophy with Laxfield. Reminder that photos of all individual children and family groups will be taken on Thursday. Please remember to send your child to school in their sweatshirt. Thank you. There will be cakes for sale this Friday after school in the front playground pavilion. 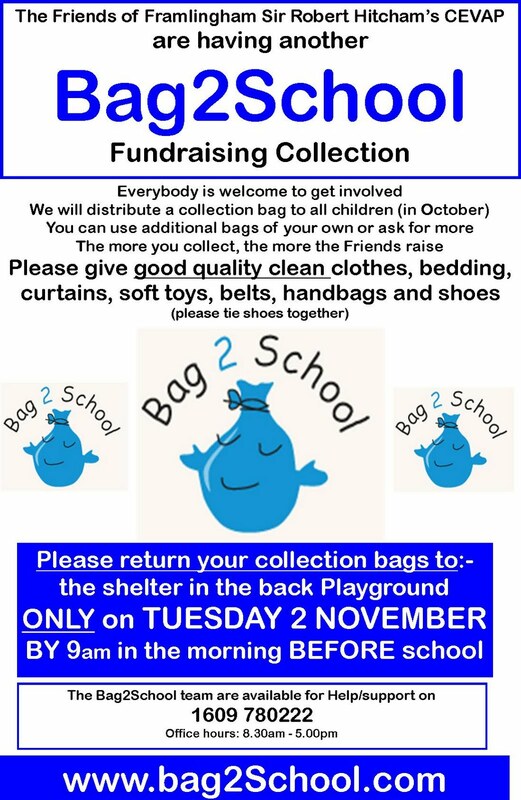 Please return the charity bags with unwanted clothes, bed linen, soft toys, bags, belts and shoes to the back playground shelter on Tuesday 2 November by 9am. Thank you. SCC Catering are planning a special Bonfire Lunch; Guy Fawkes Fingers (Sausages) or Vesuvius Veggie Sausages, Firework Fries, Bonfire Beans, Sparkler Sweetcorn, plus Twinkling Toffee Cream Tart. 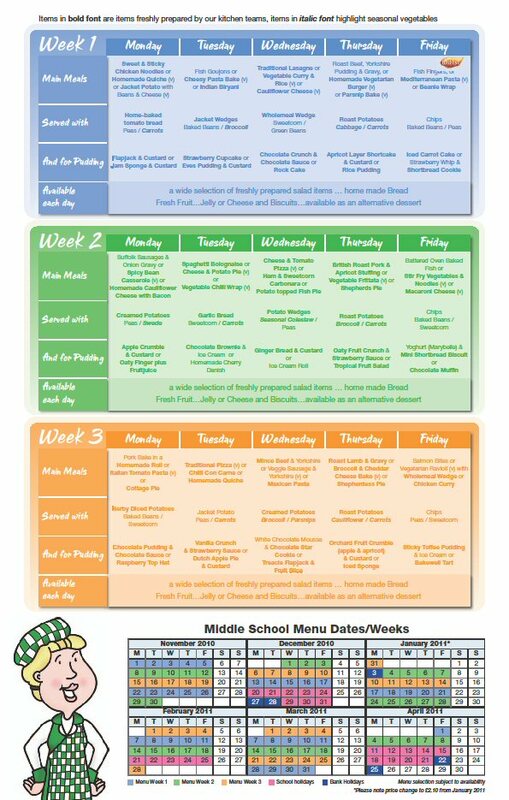 With this letter please find your copy of the new dinner menus that run from November until April. The Friends recent newsletter included information about this website which, once you have registered, you can use to do internet shopping at many online stores. The online stores then give a % of your purchase price directly to our school (as your selected charity) – it does not cost you anything and the school benefits directly. The Friends politely ask that you consider using this when doing any online shopping. www.TheGivingMachine.co.uk. Thank you. We would like to remind parents that we have a computer set aside in the library/computer suite that parents may use. Please speak to the office when you wish to use it, we only charge for printing. Half term commences on Monday 25 October, the children return on Monday 1 November. The school’s Pupil Database is updated during the year with any changes to your child’s personal details. With this letter please find a copy of the latest pupil data we have for your child/ren. Please check the details and write on any necessary amendments, sign the sheet at the bottom and then return it to the school office. Emergency Contacts: It has been noted that some children have only 1 contact number – obviously if there is an emergency with your child and that number is unanswered it means we have no alternative contact. Wherever possible can you please provide more than 1 contact person / number. Other Information: The system will only allow us to enter 1 selection for Travel Arrangements - if your child uses the school bus even if occasionally, please tick ‘School Bus’; otherwise tick the mode of transport that is used most frequently. Keeping these details up to date at all times is very important and if any information should change during the year, please let us know. Please return the data check sheet to us as soon as possible, but no later than Friday 15 October. Each pupil data sheet MUST have a parental signature at the bottom of the page. INDIVIDUAL AND FAMILY PHOTOGRAPHSOn Thursday 21 October photos of all individual children and family groups will be taken. The children will be photographed in their school sweatshirts. 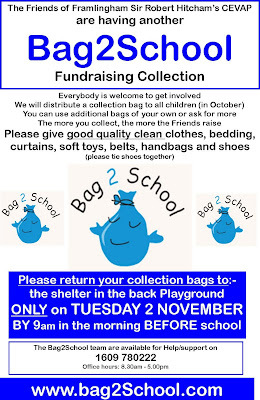 If you wish to bring pre-school children into school to join your family group photo, please come to the hall at 8.30am. YOUNG ART EAST ANGLIA COMPETITION AND EXHIBITIONWe have recently received information about the 2011 Young Art East Anglia competition. If your child would like to take part in this, he or she should produce a piece of art work on the theme of “Unforgettable”, using any medium except bulky collage, which is too heavy to hang. It should be no larger than A3 size and must not be mounted or laminated. The entry must be accompanied by a minimum donation of £1.00 which will help to raise money for Cancer Research UK, and the child’s name, year and school name must be printed clearly on the back. First, second and third prizes are to be awarded in each age-group (Reception to Year 2, Years 3-4, Years 5-6) and all prize-winning entries, as well as a percentage of pictures from each school, will be included in an exhibition at the Peter Pears Gallery in Aldeburgh from 11-13 March 2011. Postcards of all exhibited work will be for sale at the exhibition. Please hand all entries in to our own school office by Friday 14 January 2011. As in previous years we are again supporting Samaritan’s Purse. Each shoe box should be filled with items as specified in the leaflet and should be clearly labelled. PLEASE NOTE THAT DUE TO CUSTOMS REGULATIONS there are items that cannot be included – please read the leaflet. We cannot send the boxes if there is no £2.50 to cover the transport costs. So please only send in shoeboxes with the accompanying £2.50. Extra leaflets are available from the school office. Please return the filled shoe boxes by FRIDAY 5 NOVEMBER. Thank you. Click on picture to go to a website with more infoprmation and videos. MATCH ATTACK CARDS Reminder that these were banned last year, pupils should not bring them into school. Thank you. 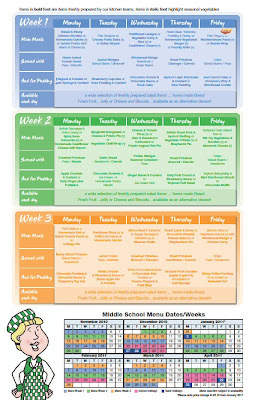 HALF TERMHalf term commences on Monday 25 October, the children return on Monday 1 November. The children of Class PL/DD enjoyed having lots of parents and grandparents in school on Tuesday afternoon. They had fun with numeracy activities based on their Europe theme. Activities included Eiffel Towers counting in 10s and 100s; Pizza Fractions and the London Eye made out of 3D shapes. The 3rd and Final Round of 7-a-side house matches was played in the rain last Friday after school. Hitcham comfortably beat Howard. In the battle of the top 2 teams Mills went 2 goals up against Bulstrode but in a dramatic last few minutes the blues managed to get a draw. The equaliser came with the last kick of the game. The teams will now play each other again in a 9-a-side format on the larger pitch. The results from the 7-a-side leave Mills on 7 points, Bulstrode on 5; Hitcham on 4 and Howard with 0. The school teams (A and B) are in action next Friday at the District tournament. Friday 15th at Stradbroke High School. Click here to go to his website. Children in our nursery have been painting pictures of big red combine harvesters. You can see all of them on the video below. The reception class have been making pictures with shapes.